Sooooo, my birthday is coming up this weekend. And how do I want to celebrate my birthday? 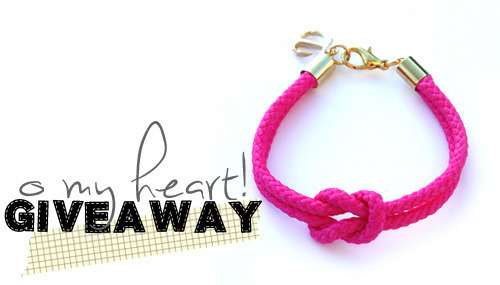 By offering you a chance to win a pretty awesome gift, of course! I was so excited when the lovely Kate of O My Heart! recently started up her new shop. I’m a big fan of supporting small, handmade businesses. And when it’s a fabulous fellow blogger and friend, I’m only that much more smitten! Anyway, Kate makes the most chic little rope bracelet and necklaces. 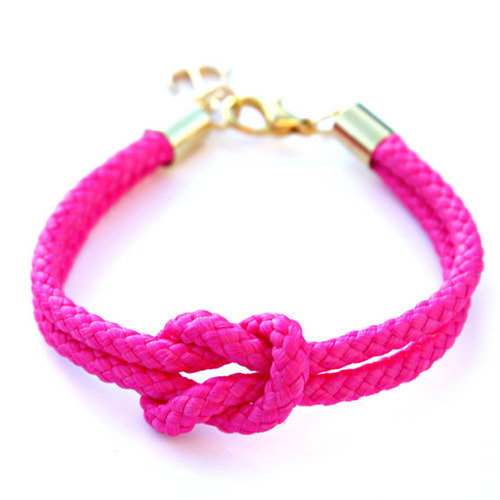 And, in honor of my birthday, she is offering up one of her Neon Pink Rope Bracelets to one lucky winner! 1. Follow HollyDolly via Bloglovin’, Tumblr, or whatever other reader you choose. Leave a comment telling me how you follow along. Please leave your email as well! That’s a total of 6 possible entries! This giveaway is open worldwide. Please leave your comments in the DISQUS form, as tumblr comments will not be counted. Giveaway will close on Sunday, April 22nd (my birthday!) at 9pm EST. The winner will announced the following day. Good luck! And may the odds be ever in your favor (sorry, I had to).